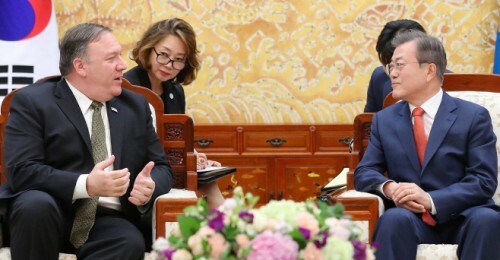 U.S. Secretary of State Mike Pompeo met with North Korean leader Kim Jong-in in the North Korean capital of Pyongyang on Sunday, and the two agreed to arrange a second summit between the two countries at the earliest possible time. "After arriving in South Korea to meet President Moon Jae-in, Secretary Pompeo said both the U.S. and North Korean side will continue discussions to decide specific timing and venue for the second summit," Moon's press secretary Yoon Young-chan said in a statement on Sunday. "Pompeo told Moon that he and Kim discussed denuclearization measures to be taken by North Korea and the issue of inspection on those actions, as well as the measures the United States would take," Yoon said. Pompeo arrived in South Korea on Sunday after having a luncheon meeting with the North Korean leader for about 3 1/2 hours. Although they did not have given specific details, it seems they have made progress on denuclearization. Pompeo, who departed from Tokyo to Pyongyang in the morning, met Kim for about two hours first in a business session, and then had a 90-minute luncheon together at a state guesthouse, according to Bloomberg and the Washington Post. "It's a very nice day that promises a good future for both countries," Kim told Pompeo as they sat down for the meal. "Thank you for hosting, President Trump sends his regards," Pompeo replied. Reuters reported that Pompeo and Kim had discussed how to dismantle Pyongyang's nuclear and missile programs. A US official who was part of Pompeo's delegation said the trip was "better than the last time" but added: "It's going to be a long haul." As soon as his trip to Pyongyang was finished, Pompeo flew to Seoul to meet President Moon Jae-in. Pompeo said he had a "good, productive conversation" with Kim. He said that more needed to be done as President Trump had said, but his trip to the North was "another step forward" to denuclearization. He also expressed gratitude toward Moon and agreed it was important to visit Pyongyang and Seoul in sequence. "South Korea is playing a very important role in pushing forward the denuclearization, so it's very important to visit here immediately," Pompeo said. President Moon in turn said today's meeting was "greatly important" for the two Koreas and the U.S.. Moon said he hoped the second summit between Trump and Kim would "make irreversible, decisive progress in terms of denuclearization as well as the peace process." Pompeo plans to visit Beijing on Monday.